The first pasture raised animals we got were a group of small Herefords. Some of them qualify as miniatures, others as what is considered classics, with frame scores ranging from 00-2. We chose them because we are small people so small cattle fit us. We love the docile nature of Herefords and they are very efficient at converting grass to meat. Our goal is to grow to a herd of 30 cows which we calve and finish on the farm, meaning they live their entire lives on our farm. Our calves are born out on pasture, are weaned by their mothers naturally, and receive no grain at any stage. They graze throughout their whole lives, even in winter. 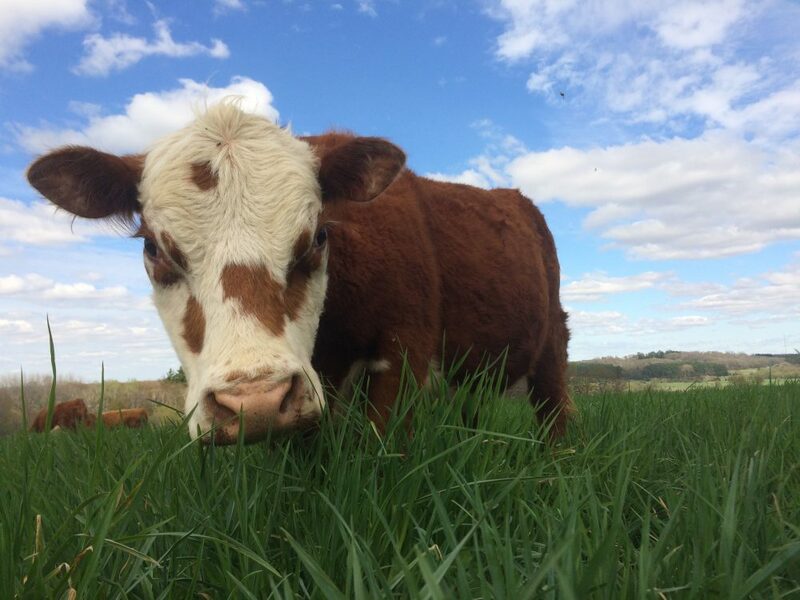 We love watching our cows graze green pastures and kick up their heels at fresh grass, it’s a good way to pass an evening as the sun goes down. 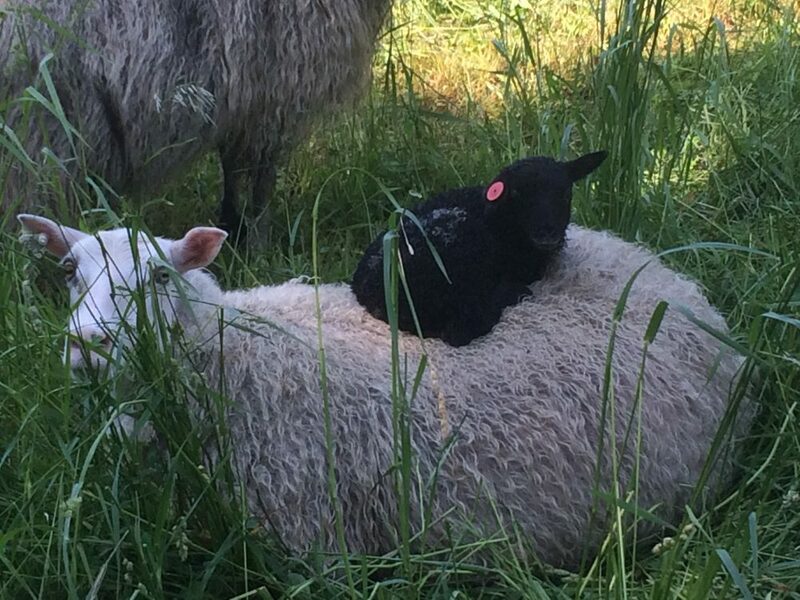 We always knew that we wanted to have multiple species on the farm, and sheep are a natural companion to cattle. People often say that sheep are “little cows,” and we have found this to be very true and untrue at the same time. When deciding on a breed of sheep, Icelandics were a natural fit for us. We used to live in Norway, and Icelandics are literally the sheep of the Vikings. This hardy breed was virtually unchanged for a thousand years while isolated on Iceland. Their hardy nature make them a good fit for our Wisconsin climate, and their historic diet of sparse grasses promised they would do well on a pasture-only diet, and they do. Their mild-flavored meat is prized around the world and is a far cry from the lamb that most Americans think of, not to mention their beautiful and luxurious fiber comes in many colors. Our sheep thrive on our pastures and grow lambs that finish in just a few months and create delicious meals for our family and yours. After being in the farming game for five years we decided we were ready for a new adventure. While pigs had always been something we’d thought about, we put them on the back burner for a long time. Until 2017 when we dove head first into pig ownership by purchasing a herd of Registered Large Black Hogs, including five sows, four boars, and 18 feeder pigs. While the breed name is not exactly creative, we love this breed. What’s to love? Well, the floppy ears, the kind eyes, and docile temperaments for starters. 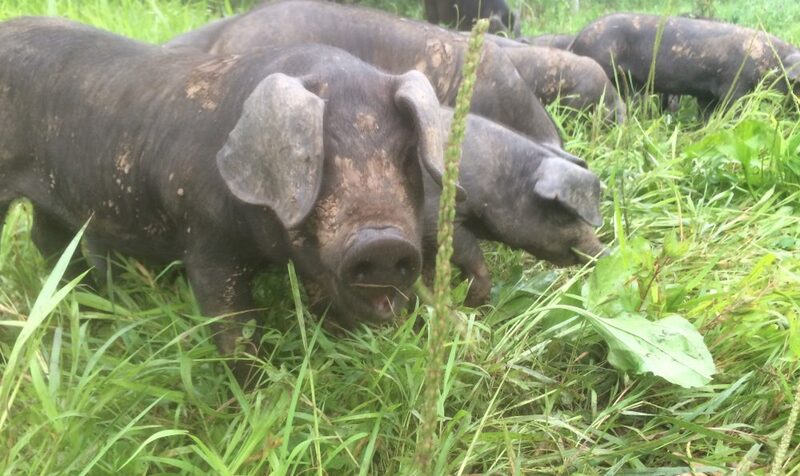 These gentle giants are great foragers, and while pigs aren’t ruminants and can’t live on grass alone, they are able to get a substantial amount of their nutrients from pasture. We feed them a limited amount of a non-gmo corn, barley, and flaxseed meal mixture everyday which provides them the correct amount of proteins. Because perfection takes time, we grow them slow, taking a year to finish instead of the six months typical in other breeds. And what do they provide in exchange for this pampering? A deep red, well-marbled pork with long sides of bacon and oodles of flavor. Don’t believe me? Try some for yourself by visiting our store. Want to learn more about our farm and receive updates? We'll let you know when we have new blog posts, markets, shows, and products! Thanks for joining our farm family!